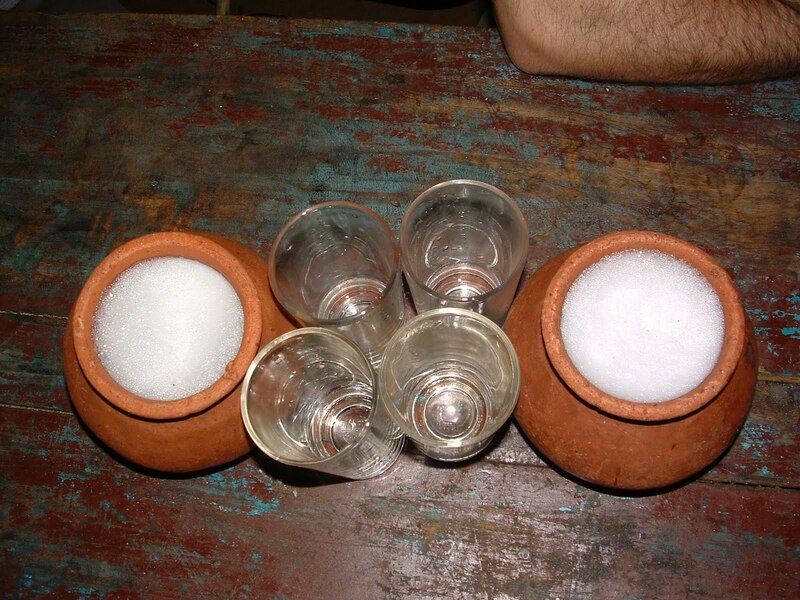 For those who prefer sweet alcoholic beverages, the toddy sap obtained soon after it is tapped can be a real treat. Its mildly intoxicating and very different from the stale-cider tasting fermented toddy one gets from roadside “toddy shops” in Kerala! Toddy is usually drunk soon after fermentation by the end of day, as it becomes more sour and acidic day by day. 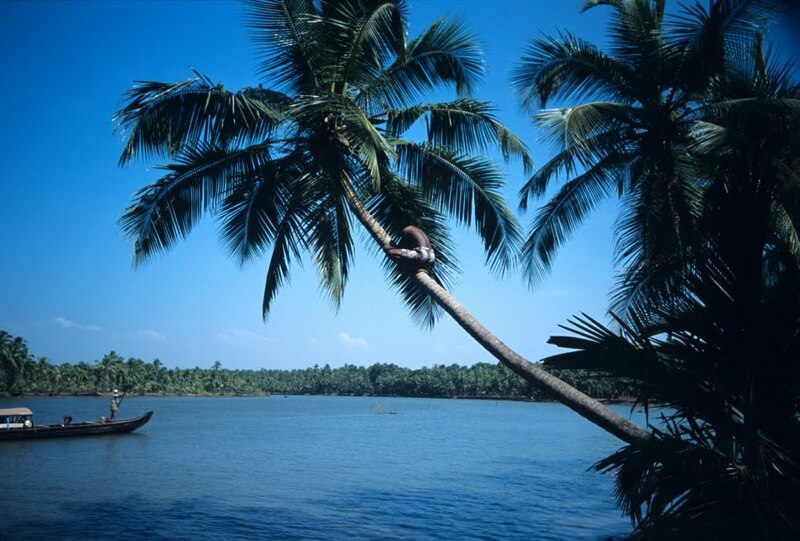 In most of parts of Kerala, toddy is collected from the toddy palm by a community of people called 'Ezhava'. In the northern part of the state, they are popularly known as 'Thiya'. How the Thiyas came to be the traditional toddy tappers is an interesting tale. This story was shared by one of our interpreters called Anwar, the mangrove man! Parvati, the daughter of Himalaya and the consort of Lord Shiva (one of the gods of the Hindu Trinity) was getting restless in their abode in 'Mount Kailash'. She noticed that people on earth where extremely happy and suggested Shiva that they visit and find out the reason for their happiness. After some initial hesitation, Shiva agreed to take on the human form and grant her wish and visit the earth and landed in Kerala. Compared to the snowy Mount Kailash, Kerala was green, covered by rain forests, wild rivers and animals. People were content and enjoyed life. Shiva and Parvati wandered about the whole day in the lush green meadows and forests and soon got tired and fell asleep by a tree. Woken up rudely by the buzzing of bees, Shiva got up feeling very thirsty. He noticed the bees buzzing around a sweet-smelling liquid flowing out of the roots of the tall tree they was resting under. He took a sip of the liquid to quench his thirst and felt refreshed. He had a few more sips and became increasingly tipsy. By the time Parvati woke up, he was rather intoxicated and was at his flirtacious best! He troubled her enough that she had to run for cover. Exhaustion once again made Shiva sleepy and Parvati wondered the reason for her husband’s sudden amorous behaviour. She soon found the liquid flowing out of the tall tree and to ensure that Shiva doesn’t reach out for the liquid again when he wakes up, she caressed and rubbed the trunk and made the sap reach up to the top of the tree. As expected, Shiva reached out for the drink the moment he woke up. Finding the root dry and hearing his wife giggle, Shiva realized what had happened. Legend has it that Shiva created a man out of his left thigh who he trained to climb the palm and tap the sap. The tree was the coconut palm and the drink the sweet toddy that we know today. The man who was created out of the body of a God (known as 'Deva' in Sanskrit, 'Daivom' in Malayalam and 'thaivam' in local parlance) came to be known as "Thiya" and to date, men from this community are expert toddy tappers! Every time a tapper climbs the toddy palm or a coconut tree, we are reminded of the man who originated from the God Himself. Perhaps it’s one of the reasons why some communities in Kerala still prefer toddy as a divine offering to the Gods when compared to the customary and more traditional milk in most other places in India. Thats a lovely piece of info. Thanks for sharing.